Happy New Year to you and your family, from my wife and me. What better way to celebrate the holiday season than to take a sail off the coast of Costa Rica in the Pacific Ocean on a warm, sunny day between Christmas and New Year's. Yes, that is when this photo was taken. For those people who live in cold climates, I am sorry to rub in the beautiful weather that we have at this time of year. Although Costa Rica is north of the equator, people refer to November through April as "summer" because it is our dry season and you can count on lots of sunshine, almost no rain, and temperature in the 80's (F) or 27-32 (C). Julie's shirt says "Pura Vida" which is the national slogan of Costa Rica. It translates literally as "pure life," but in Costa Rica it is used in a way that is similar to the way "Aloha" is used in Hawaii. People use it to say hello, goodbye, they are fine, thank you, etc. With weather in December like what you see in this photo, it is indeed, a time for pura vida. For a contrast to warm tropical sunshine, our photos this week on Viva la Voyage show winter in Vienna, Austria. We hope you find them of interest. A sailboat with tourists heads out of Tamarindo Bay for a sail along the Pacific Coast. Most of the sailboat excursions will combine an opportunity for snorkeling with refreshing snacks of cheese, crackers and fresh fruit, and will stay out until sunset. The sailing trips are definitely a good time, as you will see tomorrow. The contrast between today's photo and the photos we are showing this week on Viva la Voyage could hardly be greater. We are showing some photos from a winter trip to Vienna. We hope you find them of interest. 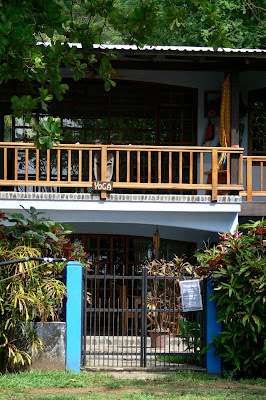 There is a house on the south end of Tamarindo Beach that has a sign advertising that it is a spot for yoga. I have seen the sign for the same house on the road that runs from Tamarindo to Langosta, near the Capitan Suizo Resort. I took this photo from the beach. It looks like a nice setting for yoga. My mother-in-law does yoga whenever she can, which is not as often as she would like because she cares for her mother, who lives with her. My wife does yoga occasionally, usually when we are on vacation. I have done yoga once. My wife assured me that there would be men there and I would not feel out of place. Well, there was a room full of 20 - 30 women and no men, and they were all a lot better than me, as I have an old tennis injury that prevents me from standing on my left leg. The only part of yoga I could do well was when they told us to lie down and relax. This session was after a long day at work, and I fell asleep. My wife was mortified and utterly unpersuaded by my protestations that the instructor said to relax, and that is exactly what I did. She has never again asked me to go to yoga with her. On our travel photo site, Viva la Voyage. we are showing some photos of the holiday season in Vienna, Austria. We hope you find them of interest. This third and final installment in my little series of pelican photos illustrates the tendency of pelicans to flap their wings in unison with each other, which I mentioned yesterday. All four are not perfectly synchronized, but the two closest birds seem to be flapping together and the two more distant birds are close together in their wing stroke. When you see a large flock go by, flapping together, it is almost as though the pelican in the front of the line is like the drum major in a marching band. One of the regular readers of this blog, Brattcat, who is the author of an excellent Daily Photo site for Brattleboro, Vermont, asked a question in a comment about whether the pelicans make noises like geese, which I guess she hears in Vermont. No, they fly by silently, which is a frustration for me as a photographer because often they are already part of the way past before I notice them. Here is another view of a flock of pelicans flying up the beach past our condo. One of the unusual aspects of pelicans is that not only do the fly in formation, but they seem to flap their wings in synchronization with each other. As you see in this photo, this entire group has their wings in the same position. Today is Sunday, so we have posted new photos on Viva la Voyage. We are following up last week's photos of Christmas in Vienna with some additional photos of Vienna. We hope you find them of interest. It occurs to me that I have never shown photos of the birds that we see perhaps the most often -- pelicans. From our condo on the beach in Playa Langosta, we see lines of pelicans, often in a "V" pattern, flying up or down the beach. I am not sure where they are coming from or where they are going. They do not land and walk around town. Unless I have the camera out on our balcony with me, they are gone by the time I get my camera. I took this photo from our balcony looking out at the afternoon sky to try to envision what type of sunset we would have. When not flying by in a group, we can see individual pelicans diving into the ocean to catch fish. There are 8 species of pelicans, but only one, the brown pelican, is found in Costa Rica. This week we are showing scenes of Christmas in Vienna on Viva la Voyage. For Christmas Day, here is a stained glass window window of the Virgin Mary and infant Christ in the Basilica de Nuestra Senora de los Angeles, or the Church of Our Lady of the Angels, in Cartago, which I have shown the last few days. For Christians around the world, Merry Christmas. For those who are not Christians but who live in countries that observe Christmas as a holiday, Happy Holidays. Although my children are now grown, I recall the excitement of Christmas morning for them. Today there are countless families sharing the joy of Christmas, and tired parents who enjoy the enthusiasm for Christmas morning vicariously through their children, and who by this evening are grateful that they now have a holiday weekend to relax, spend time with family, and sneak in a few naps to catch up on their sleep. I think that Austria, Germany and Switzerland know best how to celebrate Christmas, so this week we are showing scenes of Christmas in Vienna on Viva la Voyage. It is Christmas Eve, so here is the inside of the Basilica de Nuestra Senora de los Angeles, or the Cathedral of Our Lady of the Angels, in Cartago. There are Christmas decorations on the pillars. The inside of the church is laid out in a double cross shape, with an octagonal dome in the middle. In Costa Rica, hardwooods are plentiful and are used in the interior. You cannot tell from this photo, but the pillars are in the shape of a cloverleaf. For scenes of a traditional Christmas, please check out this week's photos on Viva la Voyage. We are showing photos of the Christmas holiday season in Vienna, Austria. This is a side view of the top of Our Lady of the Angels Basilica in Cartago. In Spanish, it is Basilica Nuestra Senora de la Angeles. This is the holiest site in Costa Rica. The ornate white design of the church exterior reminds me of a very elaborate wedding cake. This cathedral holds la Negrita, a small figure of a dark skinned Virgin Mary that miraculously reappeared on a rock on this site twice after being removed in 1635. In the past I have told the full story and showed photos of la Negrita and the church, including the area of a spring whose waters are regarded as having curative powers. That series of photos is accessible by clicking on the "Churches" index tab. Cartago is in the Central Valleys region of Costa Rica, not far from San Jose. It was founded by Juan Vasquez de Coronado in 1563 and was Costa Rica's first capital, until 1823. The church shown in this photo dates to 1929, replacing several earlier churches, dating to 1575, that were destroyed by earthquakes. The city was also heavily damaged in 1723 when nearby Irazu volcano erupted. For scenes of a more traditional Christmas, please check out this week's photos on Viva la Voyage. We are showing photos of the Christmas holiday season in Vienna, Austria. Christmas decorations seem out of place amidst a tropical resort, but the Barcelo Hotel in Langosta Beach has holiday decorations spiraling around the poles of its lobby. Holiday vacationers are enjoying the pool and the sunshine. I have seen lots of photos of snow lately on the Daily Photo websites from Europe, USA and Canada, so I thought you might like to see what the Christmas season is like in sunny Tamarindo, Costa Rica. The Barcelo Resort is an all-inclusive resort in the Langosta area of Tamarindo, which is an upscale residential area. It has a small casino, although I have never been in the casino even though our condo on Langosta beach is only about 50 meters from the Barcelo Resort. In Costa Rica casinos are restricted to hotels, and the size of the casinos are small and are limited to a certain size based on the number of rooms in the hotels. The casinos are not gaudy or flashy. At the Barcelo, you would not know that there is a small casino on the property unless you noticed a little sign in front. Most people come to Costa Rica for the beaches, the wildlife, and the natural beauty, not for casinos. Christmas in a tropical paradise is different than a traditional Christmas, of course. For scenes of a more traditional Christmas, please check out this week's photos on Viva la Voyage. We are showing photos of the Christmas holiday season in Vienna, Austria. For the next installment of my Christmas week series of photos, here is a mother and child on Tamarindo beach. I don't think there is a need for me to elaborate on this photo. You get the picture without any words from me. For my first installment in a series of Christmas week photos, here is a church in a small village east of Nicoya, near Barra Honda National Park. This is a typical local church in a typical rural village. About 85% of the population of Costa Rica is Roman Catholic, of course. During the Spanish colonial period, Costa Rica was largely ignored by Spain because it did not have gold or other riches, but the Church did manage to convert the small percentage of the local population that survived the onslaught of European diseases. Costa Rica never even had a struggle for independence. When other areas of Central America obtained independence, the Spanish just gave up Costa Rica also. Costa Ricans did not even learn that they were an independent country until weeks later. Today is Sunday, so we have again posted new photos on Viva la Voyage. For this Christmas week, we are showing photos of the Christmas holiday season in Vienna, Austria. Support vehicles for bicycle racers are critical. Yesterday I showed the Tour de Costa Rica bicycle racers speeding down the roadway. After the racers passed, there was a stream of support vehicles for the racers that were following the bicyclists. When I see TV reports of cycling races, it amazes me that there are not more accidents because of the congestion of riders, support vehicles, camera crews and spectators on narrow and sometimes mountainous roads. On our travel photo site, Viva la Voyage, this week we are showing photos of the animals of Monterrey, California. The day before yesterday was the first day of the Tour de Costa Rica bicycle race, which runs from December 16 - 28. The official name of the race is the Vuelta a Costa Rica. I am not at the location of this year's race, so I am today posting a photo of the Tour de Costa Rica from several years ago, when I happened to be on a bus that pulled over as the stream of riders sped past. I reached for my camera to take a quick shot. Costa Rica is the location of several international bicycle races, including a race that is billed as the toughest mountain bike race in the world. There is another bicycle race that goes from the Atlantic to the Pacific. There are not many locations where you could ride a bike all the way across a continent in just a few days. Some of the top bicycle racers in the world, including the winner and top contenders of the Tour de France, have come to Costa Rica for races. I apologize for the reflection and framing of this photo, but this was the best I could do in an instant. OK. I know this is a little strange. Or a lot strange. In 18 months of this blog, I am addressing a new subject today. I have shown several photos recently from the Garden Plaza Shopping Center in Tamarindo, so here is the washroom area of the rest room at the shopping center. From having travelled in foreign countries with groups of Americans, I know some Americans are concerned about the availability, the facilities, and the cleanliness of public restrooms in foreign countries, particularly in the developing world. Although rare in the USA, it is not unusual in other countries to have one sink area that serves both men and women, and that is the design of the rest room at the Garden Plaza Shopping Center. There are separate areas for men and women at the restroom, and then there is this atrium area where the sinks are located, with lounge chairs for sitting. Costa Rica is the most prosperous country in Central America. It is the only country in Central America with more than 50 years (actually, 60) of uninterrupted democracy. Its health care and literacy are comparable to the USA. Nevertheless, it is still a developing country in some respects. When it comes to public rest rooms, it is adequate, although not as plentiful as you would find in the USA or Canada because there are not fast food chain restaurants located all over the place. (The nearest McDonald's to Tamarindo is more than an hour away, although we have a Subway and Pizza Hut). 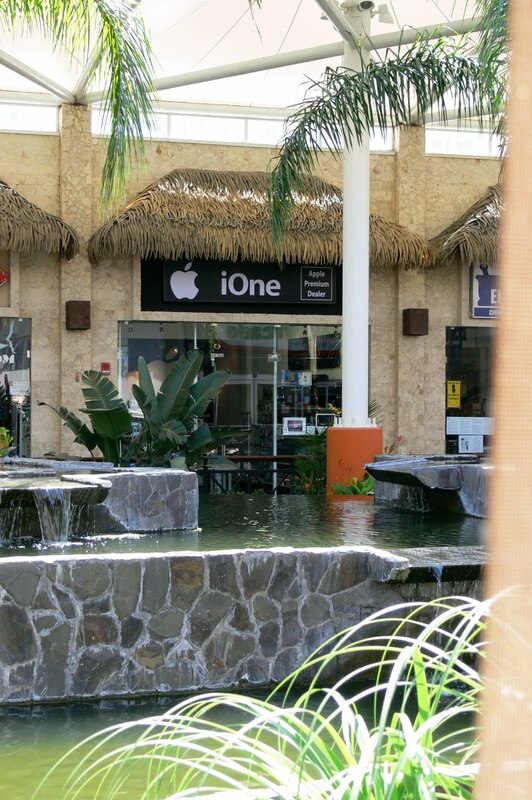 But I am sure you will agree that the Garden Plaza Shopping Center in Tamarindo has provided well for its visitors. Believe it or not, this mural greets customers when they walk into the little cafeteria that is part of the Papagayo Do It Center, the large store that I showed yesterday. I confess that I am not sure about this painting. I love art, so it is a good thing to have a mural in a store cafeteria. A mural of an ocean scene is appropriate for Costa Rica, as the Pacific Ocean is nearby. But what is with the expression on this fish? He is smiling, so perhaps he is supposed to be friendly, but look at all those teeth. Maybe he is smiling because he is about to devour any small children who walk nearby. And, those eyes! He looks like he is a little cross-eyed, and his eyes are rather menacing. On our travel photos site, Viva la Voyage, this week we are showing photos of the animals of Monterrey, California. Yesterday I showed home furnishing store that has closed. Here is one that is still open. 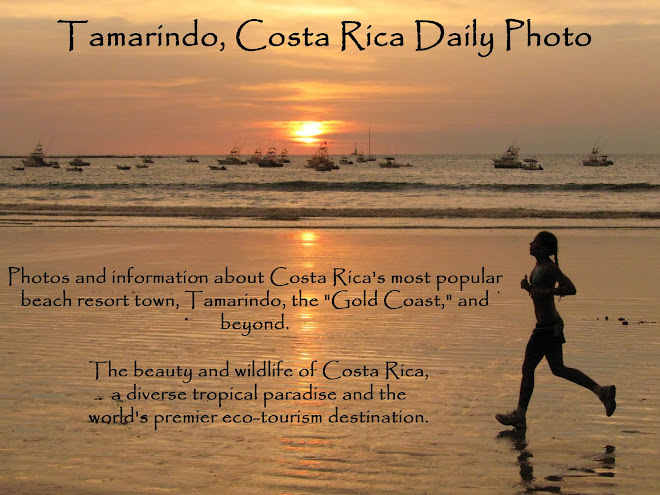 This is located about 40 minutes from Tamarindo, on the main road to Liberia, the capital of the Guanacaste province. As you can see, even though Costa Rica is a developing country, "big box" retailing has come to Costa Rica. This is the furniture section of the Papagayo Do It Center. The same store sells electronic appliances, hardware, housewares, and more. The store is about twice the size of what you can see in this photo. Tomorrow I will show you something about this store that reflects a tropical touch. I have been showing some photos from the Garden Plaza Shopping Center, so I am sharing this photo of a home furnishing store at the shopping center. There is a sad story behind this photo, however. I took this photo about 18 months ago. I thought it would surprise some people, as such contemporary interior design and a large, modern home furnishing store is not what you would expect to find in a small Costa Rican beach town that has only recently graduated from a fishing village, to a surfing town, and now to a resort catering to international visitors and residents. I never got around to posting the photo, as I usually show pictures of the beach, wildlife, etc., and not stores. Sadly, this store is now closed. It is a victim of the recession. Most of the customers for a store such as this would be the owners of new homes and new condos being built in the area, as they would obviously need to furnish their entire residence. Tamarindo has only a few thousand residents, so without new housing there would not be the population to support a store such as this. Because nearly all of the new homes and condos in the area are built (and priced) to sell to Canadians and Americans, the recession in the USA has hurt the market in Costa Rica. Visitors are not as likely to have enough equity in their homes in the USA or value in their investment portfolios to decide to buy a second home or vacation home in Tamarindo or other nearby beach communities. As a result, the construction boom has slowed, not as many new houses and condos are being built, and not as many people need new furniture. The tourist market has not been as affected as the new home and condo building market, although world wide tourism is also down. There has been some softening in the tourist businesses in Costa Rica. One of the steps the country is taking is trying to market Costa Rica vacations more to Europeans, including increasing direct flights from Europe, which will make Costa Rica less dependent on the US economy. My own experience is that the rental occupancy of my two condos has remained very high, but I have reduced my prices during 2009 to achieve the high occupancy. About one-third of my guests are Canadians, the balance are Americans, except this past summer I had my first European guests, a delightful couple from Barcelona. Here is a worker performing some maintenance high on a ladder at the Garden Plaza Shopping Center. There is a shade structure with a canvas stretched across the central atrium of the shopping center to shelter the shopping center from the direct rays of the sun. Yesterday I wrote about the Apple computer dealer located in this same shopping center. Here you see a computer store that carries Dell and other products. The new computer center will teach computer skills to disabled people both for their own enrichment and to enhance their job skills. Obviously such programs are extremely worthwhile and the support of U.S. companies and the government are appreciated. Today is Sunday, so we have posted new photos on Viva la Voyage. This week we are showing photos of the animals of Monterrey, California. Although Tamarindo is a Costa Rican beach resort, the Garden Plaza Shopping Center now has an Apple computer dealer. It is not an Apple store like you would see in the USA, but it is an authorized Apple dealer that carries Apple desktop and laptop computers and accessories. Over the last few years my wife and I have switched to Apple computers, so we are pleased to have a dealer in town. The San Jose area in the Central Valley of Costa Rica is a high technology center. Intel, Hewlett Packard, Microsoft, Abbott Laboratories, and other high technology companies have major facilities there. Western Union has its Latin America regional operations center in Costa Rica. Boston Scientific has recently announced that during the next year it will double the number of its 1,700 workers in Costa Rica. Costa Rica is sometimes called the "Silicon Valley of Latin America." It is attractive to high tech companies because it has the highest literacy and most educated workforce in the region, thanks to Costa Rica having abolished its military in the late 1940's and investing its military budget in education and health care. Costa Rica has an initiative underway to increase English education. Costa Rica's laws are also favorable to foreign investment. Costa Rica is the only country in the world to have approved a free trade agreement by a vote of its people. Because of its democratic traditions, opponents of the Central American Free Trade Agreement (CAFTA) were able to cause the treaty to be submitted to a popular election. Although many farmers and labor unions feared a flood of imports, particularly from the giant economy of the USA, the public voted in favor of free trade. While I am on the subject of free trade, I should mention that Costa Rica is currently trying to conclude 16 years of negotiation of a revised trade agreement with Europe that would equalize the import duties between Costa Rican and African bananas. Costa Rica is the world's third largest banana exporting country, but Europe charges higher tariffs on Costa Rican bananas than it does for African bananas. This makes no sense and is unfair. Our photos this week on Viva la Voyage show Xcaret, an eco-park with a dinner show extravaganza on the Riviera Maya south of Cancun, Mexico. I apologize. Yesterday I showed the supermarket dairy section, but my wife said that I should have shown the produce section because people would be more interested in the availability of fresh fruits and vegetables than the dairy section. That was news to me. I figured people would be most interested in the wine section, which is why I showed it more than a year ago. I do have guests renting our condos who ask me in advance about the wine selection in the area, but I don't recall anyone sending me an email to seek reassurance that they will be able to buy lots of fresh vegetables while on vacation at the beach. Oh, well. I have learned that when my wife (Julie of Scottsdale Daily Photo) makes a suggestion, it is usually either (1) a good idea, or (2) I should probably follow the suggestion regardless of whether the suggestion is a good idea. So, here is a photo of the produce section of the Auto Mercado supermarket in the Garden Plaza Shopping Center in Tamarindo. If you think it was boring to share this photo showing the availability of fresh vegetables and fruit in our small beach resort town, please blame Julie rather than me. I have shown some of the dairy country in Costa Rica's highlands during the last two days and also about a week or so ago. Here is the dairy section of the Auto Mercado supermarket in the Garden Plaza Shopping Center in Tamarindo. It carries Costa Rican brands, such as Monteverde cheese, and imported products familiar to Canadian and American visitors and foreign residents. I frequently get questions about the availability of grocery stores from people who are inquiring about vacationing in Tamarindo and considering renting one of our two condos. The supermarket is comparable to modern supermarkets in the USA and Canada, as you should be able to see in this photo. Here is another rural, pastoral scene. These horses are grazing next to a football or soccer field. It looks like the horses are free to graze on the football field. While that could be useful in keeping the grass cut, I hope someone cleans up after the horses before the children start playing. This is a typical "tico" farm house in the central mountains and valleys of Costa Rica. Small family farms are the backbone of the Costa Rican economy. Land ownership is more widely distributed in Costa Rica than in other Latin American countries. Coffee is cultivated in small family farms. There is a proud, agrarian cultural tradition even though 63% of Costa Ricans now live in the urban areas and one-third of the country's population of 4.5 million live in or around San Jose. In the Guanacaste area of Northwest Costa Rica, where Tamarindo is located, there are some large cattle ranches with thousands of acres under the same ownership, tracing to the Spanish colonial land grants. In the Caribbean area there are huge banana plantations, but in most of the rest of the country small family farms are the mainstay. This week we are showing photos from Xcaret, an eco-park with a dinner show extravaganza on the RIviera Maya south of Cancun, Mexico on Viva la Voyage. The gray dog we have been showing the last few days was distracted by the surfer girl coming out of the water. Why? Because that meant that the gray dog's play session with the light brown dog would come to an end, as the brown dog would be following the surfer girl home. The brown dog lingered for just a little while to say goodbye to the gray dog, so he had to run to catch up to the departing surfer girl, as you can see by this photo in which the dog is kicking up a little sand and three of his legs are off the ground. The dogs will have to hope that their surfing masters will surf again at the same time on another day so that they can romp in the surf together again. My guess is that the surfers might like that, too. This week we are showing photos of Xcaret, an eco-park with a spectacular dinner show on the Riviera Maya, south of Cancun, Mexico, on our Viva la Voyage travel photo site. The dog we have been watching initially stared at the girl as she emerged from the surf and walked up on the beach. The brown dog walked from the surf up onto the beach, just as the surfer girl had done. The gray dog was equally intent on watching the brown dog leave the surf as he had been in watching the girl walk up onto the beach. Why is the brown dog walking past the gray dog? Would the surfer girl's emergence from the ocean affect the gray dog and brown dog playing with each other in the surf? What would be next for the dogs? As usual, answers will be evident from tomorrow's photo. By the way, if you notice the wave in the background, you can see that the spray from the crest of the wave is blowing out to sea. I have heard that surfers prefer that condition, but I don't know why. Today is Sunday, so we have posted new photos on Viva la Voyage. This week we are showing pictures of Xcaret, an eco-park with a dinner show extravaganza on the Riviera Maya, south of Cancun, Yucatan, Mexico. The dog we have been watching had his attention distracted from the other dog with whom he had been playing in the surf. Why do you think that he was distracted? You probably think that is a stupid question. If you think you know the answer by looking at today's photo, I should remind you that our dog is a dog, not a man. But this photo clearly showed that the gray dog has his attention distracted from playing with the brown dog by the surfer girl walking from the water up onto the beach. The dog stopped, stared, and turned his head as his eyes followed the surfer girl. Would the dog be capable of a whistle or a "cat call?" As usual, answers will be forthcoming in the photos to be posted in the days ahead. My little series of photos this week is a dog story, and I promise that today's photo will fit in with the rest of the dog story, but today I am introducing a new character to go with the grey dog that looks like an Alaskan malamut and the brown dog. Meet surfer girl. She emerged from riding the waves and headed towards the beach. How would this affect the dogs? Would she disrupt the dogs from playing in the surf? Would the dogs be distracted from playing with each other by her arrival at the scene? As ususal, the answers will unfold tomorrow and the couple of days that follow. The dog we have been watching has made a friend. I guess it should not be a surprise that dogs seem more interested in checking out and spending time with other dogs they encounter than they do about people they encounter. The dogs on the beach in Tamarindo always seem to get along with each other. Unfortunately, the meeting shown in today's photo was a brief encounter, for reasons that I will show tomorrow and the next day. Yesterday I showed this dog waiting and commented that with his long hair in the warm Costa Rican sun, he may want to take a dip in the ocean to cool off. Here he is doing exactly that. During the next few days I will post a little photo series to show what else happened while he was passing the time when his master was out surfing. I thought a Costa Rica version of a dog waiting for his master would be a good choice for the worldwide Daily Photo theme of "waiting." There are few things better than the patience of a waiting dog and the excitement, affection and joy that a dog shows upon his master's return. In Tamarindo, you would not expect a dog to be waiting with a newspaper and slippers for the master to return from a busy day at the office. Here is a more typical pose for a waiting dog in Tamarindo -- a dog waiting for his master to finish surfing! The patience of this dog is even more admirable when you consider that this dog would not seem to be the most suited to the climate along the warm Pacific coast of Costa Rican. 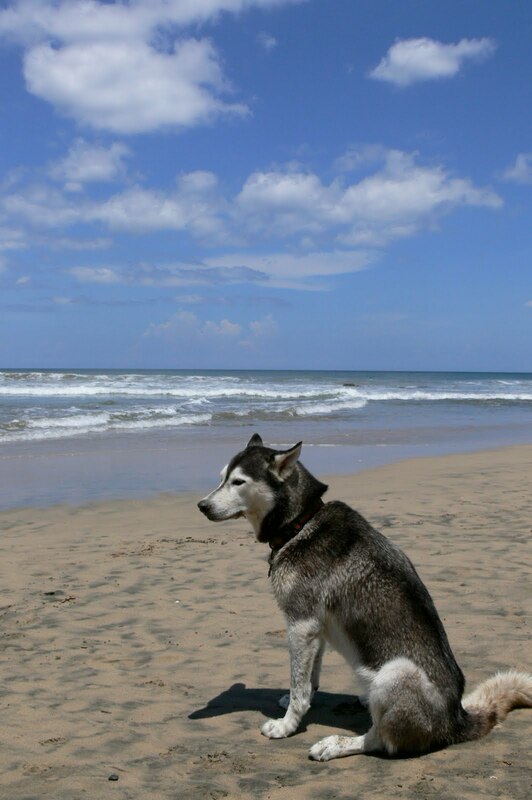 I am sure that he enjoys the breeze off the ocean, and of course he can take a dip in the ocean to cool off, but in the warm weather 12 months of the year in our area of Costa Rican he will never experience the temperatures for which his thick coat was intended. Maybe his owner is on vacation in Tamarindo from the central highlands that I have shown in my photos during the last few days. This photo was taken very close to our Langosta Beach condo. We are showing photos this week of the unique Mayan pyramid of Ek Balam in the Yucatan, Mexico at Viva la Voyage.